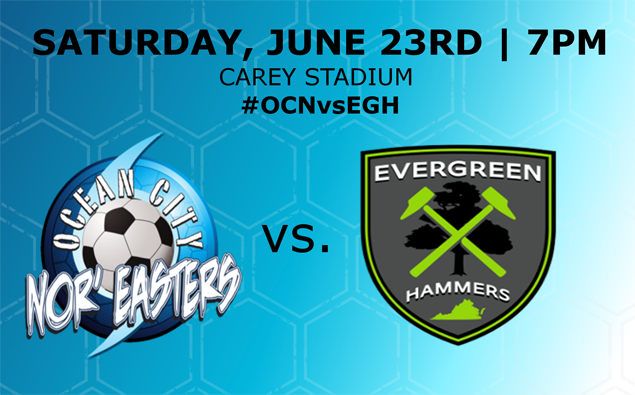 The Ocean City Nor'easters will play their second home game this week with a Mid-Atlantic Division matchup against Evergreen FC tonight at Carey Stadium. The Nor'easters are looking to rebound after back-to-back losses to first-place Reading United. On Wednesday, the Storm fell 2-0 at the Beach House which snapped the club's 10-game home unbeaten streak, the second-longest streak in club history. The Nor'easters enter the game with a 4-4-0 record, sitting in fourth place in the Mid-Atlantic Division. The top two teams qualify for the PDL playoffs and Ocean City is seven points behind the Long Island Rough Riders who are currently in second place. The club also needs a strong second half finish to qualify for the 2019 Lamar Hunt US Open Cup. Luckily for the Nor'easters, five of their remaining six league games are being played at the Beach House. Ocean City has enjoyed a balanced offensive attack with Abdul Mansaray leading the team in scoring with three goals and one assist. The Wilmington University product earned all of that scoring last week in back-to-back road games against Lehigh Valley (4-1 win) and Reading United (3-1 loss). For his efforts he was named to the PDL All-Eastern Conference Team of the Week. Evergreen FC arrive at the Beach House after playing a road game last night against FA Euro New York. The Hammers fell 3-1. Valdir De Souza Claros came off the bench to score the lone goal for Evergreen as the Hammers remain winless (0-7-1) so far in 2018. The Northern Virginia-based team is run by former Northern Virginia Royals owner Mo Sheta, as the team was re-branded before the 2016 season from the DC United Under-23s. Last year, Ocean City swept all three games against Evergreen (2 home, 1 away), but it wasn't easy. After a 4-1 season opening win at home, the Nor'easters found themselves trailing 2-0 with five minutes left in regulation. Ocean City scored three goals in those final five minutes to stun the Hammers. The Nor'easters won the final game of the series on the road to complete the season sweep. This is the second meeting between the two clubs as the Nor'easters traveled to Virginia to pick up a narrow 1-0 win on Saturday, June 9. It was a pair of University of North Carolina youngsters who shined for the Storm that day as Alex Rose scored the lone goal and Alec Smir picked up the clean sheet in goal.